Modern-day Lake White is located near the old confluence of Pee Pee Creek and the Scioto River. In the 1930s when the waters of Pee Pee were dammed by the state of Ohio and the WPA, its flow was changed so that today it spills into Crooked Creek, which then runs into the Scioto. Here in the summer of 1785, Native Americans attacked a group of settlers who were attempting to establish squatter rights to lands in the Scioto Valley. Pee Pee Creek, whose waters fill Lake White, derives its name from one of the settlers who, just before the deadly attack, carved his initials into the trunk of a large beech tree. Years later, when the threat of Indian attack had ended, and permanent settlers began to fill the valley, the carved initials were rediscovered and adopted by area residents as the name for the creek, the prairie through which it once meandered, and to the Pike county township that all bear its moniker. In May of 1785 the first attempted (and illegal) American settlement in the Scioto Valley was abandoned following an Indian attack, which killed one of the settlers. At the time of the abandonment, the US military had been tasked by the Confederation Congress with keeping squatters off the lands north and west of the Ohio. If the Indians had not run them off in late May, the US Army Under the command of Gen. Josiah Harmar would have eventually attempted to break up the settlement. Indian attacks picked up in response to the American encroachments and when treaties with the Indian nations failed to stop the violence, Benjamin Logan of Kentucky launched a raid into Ohio in October 1786, wherein Federal soldiers and mounted Kentucky militia burned thirteen Shawnee villages. Rather than ending hostilities, Logan's Raid helped ignite a larger war, known as the Northwest Indian War. During this largely forgotten conflict, the stretch of the Ohio River, into which the Scioto flows, where the City of Portsmouth is now located, became the most hazardous section of the whole Ohio River. It was here that American settlers were frequently attacked and killed as they attempted to float down river to the new settlements opening in Kentucky and around Ft. Washington. Federal efforts at stopping squatters, combined with an uptick in Indian attacks and the ensuing military campaigns essentially ended the earliest efforts at American settlement in the Scioto Valley, at least, that is, until the US Army under Gen. Anthony Wayne finally broke the Indian resistance movement at the Battle of Fallen Timbers in 1795. Thus, after the failed attempt to settle the Scioto in 1785, it would be another decade before Americans returned to the area. By then, when they found "P.P." carved into a large beech tree they knew not whose name the initials belonged. The original source for this story of frontier conflict is Judge George Corwin of the Pike County Court of Common Pleas. Corwin played an instrumental role in the founding of the Logan Historical Society, the first historical society in the Scioto Valley. He was a native of Pike County, having been born in 1817, and claimed to have heard the story from an eyewitness to the events. He wrote his account for the first volume of the "American Pioneer, a Monthly Periodical Devoted to the Objects of the Logan Historical Society; or, to Collecting and Publishing Sketches Relative to the Early Settlement and Successive Improvement of the Country." 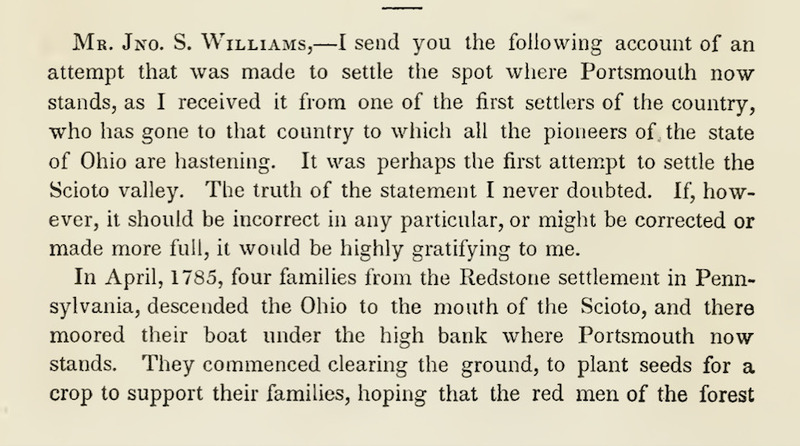 "I send you the following account of an attempt that was made to settle the spot where Portsmouth now stands, as I received it from one of the first settlers of the country, who has gone to that country to which all the pioneers of the state of Ohio are hastening. It was perhaps the first attempt to settle the Scioto valley. The truth of the statement I never doubted. If, however, it should be incorrect in any particular, or might be corrected or made more full, it would be highly gratifying to me. "In April, 1785, four families from the Redstone settlement in Pennsylvania, descended the Ohio to the mouth of the Scioto, and there moored their boat under the high bank where Portsmouth now stands. They commenced clearing the ground, to plant seeds for a crop to support their families, hoping that the red men of the forest would suffer them to remain and improve the soil. They seemed to hope that white men would no longer provoke the Indians to savage warfare. "Soon after they landed, the four men, heads of the families, started up the Scioto to see the paradise of the West, of which they had heard from the mouths of white men who had traversed it during their captivity among the natives. Leaving the little colony, now consisting of four women and their children, to the protection of an overruling Providence, they traversed beautiful bottoms of the Scioto as far up as the prairies above, and opposite to where Piketon now stands. One of them, Peter Patrick by name, pleased with the country, cut the initials of his name on a beech, near the river, which being found in after times, gave the name of Pee Pee to the creek that flows through the prairie of the same name ; and from that creek was derived the name of Pee Pee township in Pike county. "Encamping near the site of Piketon, they were surprised by a party of Indians, who killed two of them as they lay by their fires. The other two escaped over the hills to the Ohio river, which they struck at the mouth of the Little Scioto, just as some white men go- ing down the river in a pirogue were passing. They were going to Port Vincennes, on the Wabash. The tale of woe which was told by these men, with entreaties to be taken on board, was at first insufficient for then relief. It was not uncommon for Indians to compel white prisoners to act in a similar manner to entice boats to the shore, for murderous and marauding purposes. After keeping them some time running down the shore, until they believed that if there were an ambuscade of Indians on shore, they were out of its reach, they took them on board and brought them to the little settlement; the lamentations at which cannot be described, nor its feeling conceived, when their peace was broken and their hopes blasted by the intelligence of the disaster reaching them. My informant was one who came down in the pirogue. "There was, however, no time to be lost, their safety depended on instant flight ; and gathering up all their moveables, put off to Limestone, now Maysville, as a place of greater safety, where the men in the pirogue left them, and as my informant said, never heard of them more. If any of them are yet alive, or if any one can give intelligence of them, it would be thankfully received." According to Maria Ewing Martin's "Origin of Ohio Place Names," it was "many years" after the successful settlement of Pike county that residents discovered the history of this memorable place name. Perhaps it was not until the mid-1840s when Corwin's letter appeared in the "American Pioneer" that people first learned the story of the Indian attack that ended the first squatter settlement in the Scioto Valley. 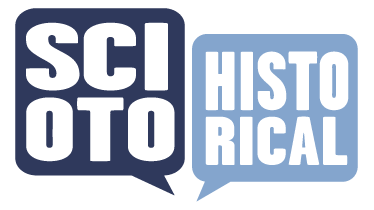 Andrew Feight, Ph.D., “Peter Patrick, Squatter Rights, & the First Attempted American Settlement in the Scioto Valley,” Scioto Historical, accessed April 24, 2019, https://sciotohistorical.org/items/show/106. “Early Attempt at Settlement” American Pioneer , a Monthly Periodical Devoted to the Objects of the Logan Historical Society; or, to Collecting and Publishing Sketches Relative to the Early Settlement and Successive Improvement of the Country. Vol. 1, No. 1 (John S. Williams: Cincinnati, 1844): 56-59. Maria Ewing Martin's "Origin of Ohio Place Names," Ohio Archaeological and Historical Quarterly (July 1905), p. 276. R. Douglas Hurt, The Ohio Frontier: Crucible of the Old Northwest, 1720-1830 (Bloomington: Indiana University Press, 1996). Alfred Thomas Goodman, “Papers Relating to the First White Settlers in Ohio,” Western Reserve Historical Society Historical and Archaeological Tracts, Number Six (Cleveland, 1871): from page 7. Colin Calloway, The Victory with No Name: The Native American Defeat of the First American Army (Oxford University Press, 2014).